Do you have a child who loves to dance along with music? If so you can enter them in the Duckle Dance Sweepstakes presented by Capezio and Wisharoo Park. Simply submit a vidoe of your preschooler doing the Duckle Dance and they could win 1 of twenty Capezio and Wisharoo Prize packages or one of five $500 Dance Scholarships. So what is the Duckle Dance? It’s a little bit of ballet, a little bit of tap, and a whole lot of whatever you want it to be but, most importantly, its moving and grooving family fun for all. Check it out yourself by viewing the Duckle Dance promotional video at www.WisharooPark.com/duckledance. 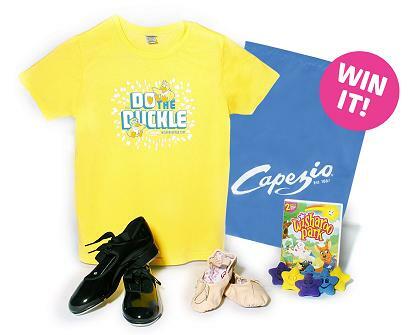 The Duckle Dance Sweepstakes Presented by Capezio and Wisharoo Park is all about fun and dance submissions are completely open to individual interpretation. In the Duckle Dance no step is wrong, no leap falls short, no tap is off. To enter you'll simply upload the video to your facebook or YouTube account, and then visit www.wisharoopark.com/duckledance where you'll submit the facebook or YouTube video link as part of the easy entry process. The Duckle Dance Sweepstakes Presented by Capezio and Wisharoo Park is open now through September 1st, 2011 for video submissions. that 1 very lucky reader is going to win! Mandatory Entry: Tell me which little dancer in your life you are wanting this prize for? This giveaway will end on September 1stThe winner will be chosen via random.orgThe winner will have 48 hours to respond. *I was sent the same prize as the giveaway. I was not asked for a positive review just an honest one. following you from Monday Monkey blog hop. would love it if you decided to follow my blog. Follower of Our Crazy Bunch on GFC!